The ritual begins with selections from Isaiah 11:9, Psalms 107:10, 14, and 17-21, and Job 33:23-24 being recited. Then a rooster (for a man) or a hen (for a woman) is held above the person’s head and swung in a circle three times, while the following is spoken: “This is my exchange, my substitute, my atonement; this rooster (or hen) shall go to its death, but I shall go to a good, long life, and to peace.” The chicken is then slaughtered and may or may not be given to the poor for food. Kapparot is not mentioned in the Torah or the Talmud. 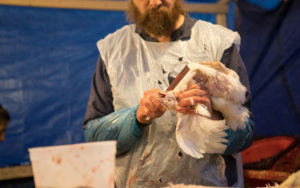 It was first discussed by certain Jewish scholars in the ninth century who claimed that since the Hebrew word gever meant both “man” and “rooster,” punishment of the bird could be substituted for that of a human. According to the Encyclopedia Judaica, other Jewish scholars strongly opposed kapparot. The 13th-century scholar Rabbi Solomon ben Abraham Aderet considered kapparot a heathen superstition. Rabbi Joseph Caro called it a “foolish custom.” Others have pointed out that kapparot does not remove sins, and if it could, what would be the need for Yom Kippur, the Day of Atonement? 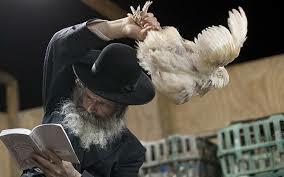 The chickens are treated poorly in the days leading up to, during, and after the kapparot ceremony. 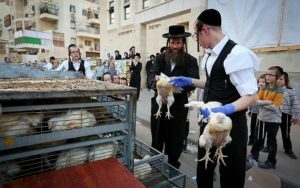 In the U.S., Israel and elsewhere where the ritual is performed, the birds are crammed in crates, where they are typically kept in their own excrement, without food, water or shelter, for six days before the “shlug kaparos” (“swinging of the chickens”) is performed on the eve of Yom Kippur. 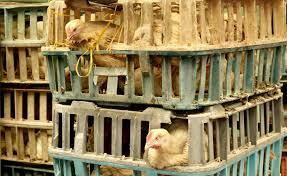 How can kapparot be carried out without using chickens? In kapparot ceremonies practiced by many Torah-observant Jews, money is put into a handkerchief which the person swings three times around his or her head while reciting: “This money shall go to charity, and I shall go to a good, long life, and to peace.” This ceremony, which is mentioned in many prayer books including the highly regarded Artscroll Siddur, preserves, even enhances, the sense of repentance and the tradition of charity, since no innocent creature has to suffer and die for a person’s misdeeds. 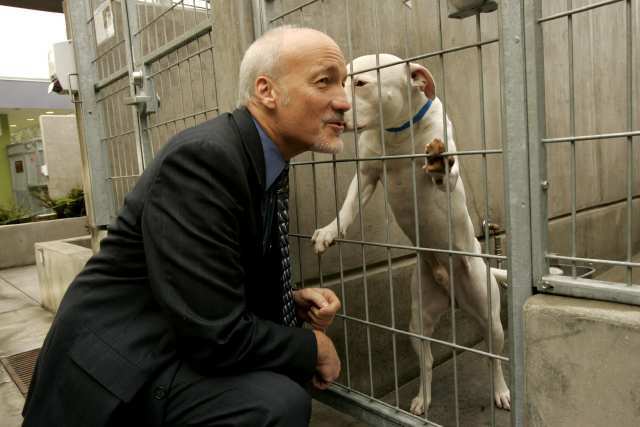 What should Jews who are concerned about the treatment of animals do? 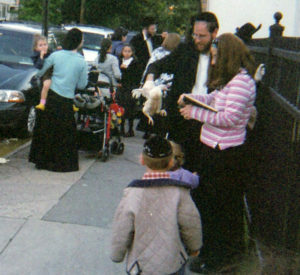 This brochure has been produced by United Poultry Concerns and is cosponsored by Jews for Animal Rights (www.micahbooks.com) and Concern for Helping Animals in Israel (CHAI), www.chai-online.org. 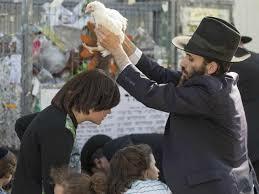 Tomorrow, Tuesday, November 13th, the Ninth Circuit U.S. Court of Appeals in Pasadena will hear an argument on behalf of United Poultry Concerns in a case against Chabad of Irvine for unfair business practices in charging a fee to illegally kill and dispose of chickens for Kapparot. The district court ruled it was not a business practice. That decision is being appealed. The district court expressed no opinion on the underlying legality/illegality of the manner in which the chickens are killed and disposed. The case is listed sixth on the docket and each case takes about a half hour, so this case may not be heard until 11:00 a.m. or so. More information on kapparot can be found via this link. 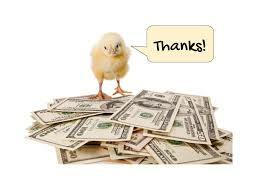 Please consider making a life-saving donation to United Poultry Concerns; an organization committed to the compassionate and respectful treatment of domestic foul.